A Fresnel-collector consists of several mirrors and an absorber tube. The sunlight is reflected by these flat mirrors directly to the absorber. In spite of the parabolic through collector, the Fresnel collector does not consist of one but of 48 mirrors with a special arrangement. Each of the mirrors is about 0,5 m wide and adjusted to the soil. An uniaxial tracking system is keeping the mirrors in the right angel to the moving sun. 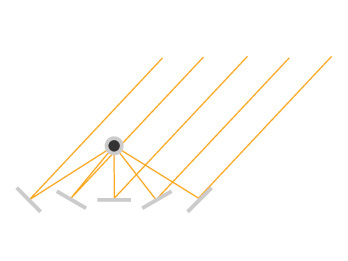 Although the suns radiation is not focused as much as with a parabolic trough collector, the Fresnel concept offers several cost advantages in production and maintenance. Especially damages because of storms can be prevented. In order to avoid the disadvantage of the Fresnel-Collectors a secondary reflector is located above the absorber tube. The sunlight first hits the flat mirrors on the bottom and will be reflected by the secondary mirror in order to focus on the absorber tube. Fresnel power plants are used for direct vaporisation. The power of such a power plant can easily exceed several 100 MW.